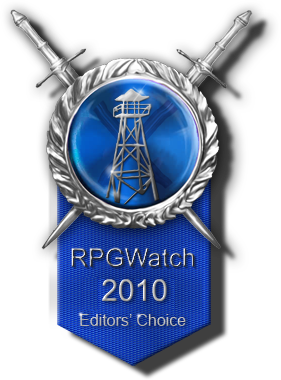 For almost one week you could vote for the Best RPG of 2010 and we now present you the results of the RPGWatch editors and your votes. There's no doubt Fallout 3 offered a compelling vision of post-apocalyptic suburbia, the senses almost overwhelmed with jumbled, broken concrete and the distance framed with the twisted ribbons of old freeways. Fallout: New Vegas takes that sense of spatial immersion but connects back to the original games to create a truly satisfying RPG. Obsidian has coupled the freedom to explore an open world with deeper quests, interesting characters, a shades-of-grey storyline and competing factions capable of pleasing both fans of Fallout and those attracted to Bethsoft's open worlds. The gameplay has been incrementally improved with tighter combat and (slightly) better balancing but the real pleasure comes from the greater range of choices and a better sense of continuity. From the "Novac" sign to Fallout character and location references to the almost-camp humour, Fallout: New Vegas understands the Fallout universe. There are some great set pieces, surprisingly complex quests with different resolutions and different character builds get to feel useful with a wide range of different dialogue skill checks from Doctor to Explosives. 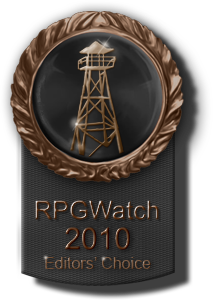 All up, Fallout: New Vegas is a deserving winner. It's amazing such a good game remained undiscovered until this "remastered" version was released. With improved framerates and lighting, better balancing and the new Flames of Vengeance expansion providing a fitting ending, the Dragon Knight Saga is a fantastic game. The minute-to-minute gameplay might feel like a standard 3rd-person action/RPG but there's an old-school sensibility that serves as a solid foundation. The quests are surprisingly good, with charming voicework and a great sense of humour - and then there's the exploration, with hidden caverns and keys rewarding diligent players. There are some memorable vistas (with an uncommon sense of height) and little hand-holding, so you'll need to actually search out solutions rather than just follow a quest-arrow on the mini-map. Besides the DLCs that were released for Dragon Age: Origins, Bioware also released a decent add-on that actually added something to the game besides new content such as skills, spells and new companions. Awakening takes place after the events that took place in Dragon Age: Origins, resulting in a slightly different start of the game depening on the choices you made. The Awakening expension has good and bad things. You can start the game with the character you've played with, if he or she is still alive, but not all of the inventory is carried over. The story is a bit thin compared to Dragon Age: Origins with you fighting even more darkspawn, but is well written. The banter between your companions is still there, but your relation with them is not that deep anymore. The combat is much easier, although there are still some tough battles. But besides having its shortcomings it actually is a pretty good expansion and if you liked Dragon Age: Origins this is something you should really play. 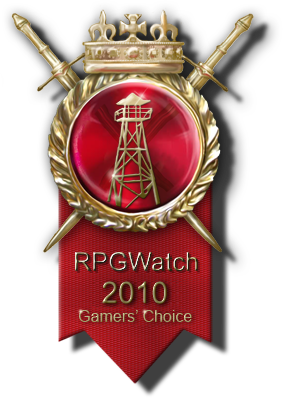 Like the RPGWatch editors, our gaming visitors also voted for Fallout: New Vegas to be the best game released in 2010. Mass Effect 2 achieved some controversy on one hand and wild success on the other. While some people argue Mass Effect 2 isn't even an RPG, BioWare's sci-fi epic was massively successful - both with the wider public and, it seems, with our readers. Streamlined and further polished from the original Mass Effect, the key to its success is undoubtedly the cast of characters and their personal quests. The overall plot looks a little flimsy if you look too closely but the structure encourages players to build relationships with a range of interesting characters, not just stick with a core small group. There are some memorable moments in those personal quests and surprising emotional gravitas for an action space opera. The effort Larian Studios put into revamping Divinity 2 was well worth it. It attracted the attention of our visitors and made it to third place, closely followed by Dragon Age: Awakenings. All other games scored a percentage of less than 2.5%.